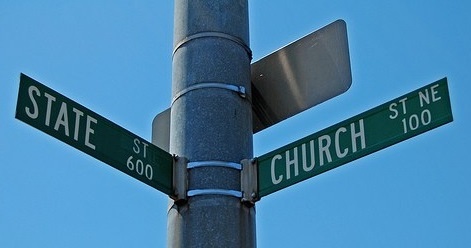 The United States has a 230+ year history of separating church and state. Most of our founders and most of our leaders have historically supported this separation. Clearly this is not a unanimous view among Americans. 2. Theocracies don’t work. They are, by definition, against personal freedom. In a theocracy, it’s “you’re free to think and say what you like as long as it doesn’t conflict with the national religion”. No thanks. I prefer actual freedom over whatever they call it in Iran, Saudi Arabia, and 17th century Spain. 3. Which church should we make part of the state? Judaism? Buddhism? Shinto? Islam? I hear none of those making a claim on the USA, so I’ve got to assume it’s strictly Christians who want this unholy alliance. Okay, then which Christianity should we use? If we do it by the numbers it goes to the Catholics. Are you ready for a government that is, in one way or another, answerable to the Vatican? And if not the Catholics, who? Maybe we should return to the one national religion we’ve ever had here – the Church of England. Everyone agree on that? And which Bible should we use? How about the Book of Mormon? Which version of the Ten Commandments? Should it be illegal to covet my neighbor’s 1981 DeLorean? Guilty! 5. Laws are designed to benefit the common good through order and fairness (yeah, I know, it doesn’t always turn out that way). This means laws must be based on more than just belief – they must be based on actual, observable benefit. Murder is illegal not because God commands it; murder is illegal because it benefits society for murder to be illegal. God commands us to not have tattoos or wear clothes woven from two fibers. Should those be illegal, too? 1 – Very Stupid. This person just can’t think rationally and we should clearly not vote for them. 2 – Very Smart. This person is using religion to get votes. This person is about as vile and evil (anagrams) as it gets. Using people’s religious beliefs to gain power is exactly why we need separation of church and state and we should clearly not vote for them either. Yes, it’s perfectly okay to be American and be Christian. It’s also perfectly okay to be American and Atheist. In fact, it’s perfectly okay to be American and <fill in any belief>. And no, there’s no War on Christmas. We can thank the separation of church and state for that.